We invite you to join us at True Nature Wilderness School for a week of primitive living skills, natural crafts, outdoor survival training and nature awareness. Traditional hide tanning, primitive trapping, foraging of wild edibles, natural cooking techniques, fashioning of stone knives, friction fire methods, hunting with primitive tools, and stalking exercises for hunting of small and large game. Our land is nestled within the Grand Staircase National Monument, one of the largest wilderness areas in the country, inhabiting both desert-canyon and mountain life. ☼ Edible & Medicinal Plants: Ethical gathering and preparation of wild edibles and medicinal plants (infusions, teas, poultices). ☼ Nature Awareness: Moving, stalking, sense meditation; learn how to use your senses to notice more, how to have more wildlife encounters, how to move silently through the forest, how to smell flowers, and how to slow down to find a real connection with the natural environment; responsible plant and animal harvesting and care-taking ethics. ☼ Variety of Cooking Skills: Primitive cooking, rock boiling steam pit, cooking directly over coals, clay pot cooking; food processing and game processing; hide processing. ☼ Shelters: Creating warm sleep without a tent and sleeping bag using local materials; Debris beds; Primitive survival shelters; material and location choosing, safe construction principles. Throughout the days, we'll explore how to use natural materials to construct a variety of tools for our basic needs, and learn how to live comfortably in the wild. Matt moved to Boulder at age 24 and started guiding and teaching at Boulder Outdoor Survival School, teaching all the hunter/gatherer courses. Primitive hunting and living off the land became his passion. Three years ago, he walked off into the wilderness on the Winter Solstice and returned on the Summer Solstice. Living with the land for 6 months, Matt has been on many primitive walks and led about 50 hunter/gatherer courses ranging 4 to 33 days. 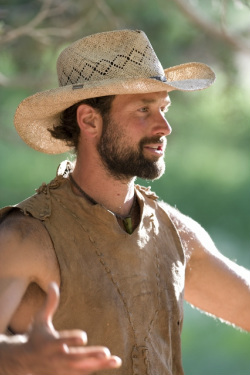 He has been a consultant for “Survivor Man” and many other TV productions, was featured in "Wilderness Way" Magazine, "Trail Runner" Magazine, and is a leader in his field.